I was once caught in a stampede of kangaroos in Australia, but resolutely I stood dead still and videoed the entire traumatic experience. Or so I thought… later when I looked at the footage, I found out it was mainly of the ground, with audio of thundering paws and the faint sound of me urinating in my pants. I can't imagine being caught in a stampede of bigger animals that could crush or gore one to death. What would my bladder do? Stampede is striking video slot created by Betsoft which is designed to work on P.C's, mobile devices and tablets. 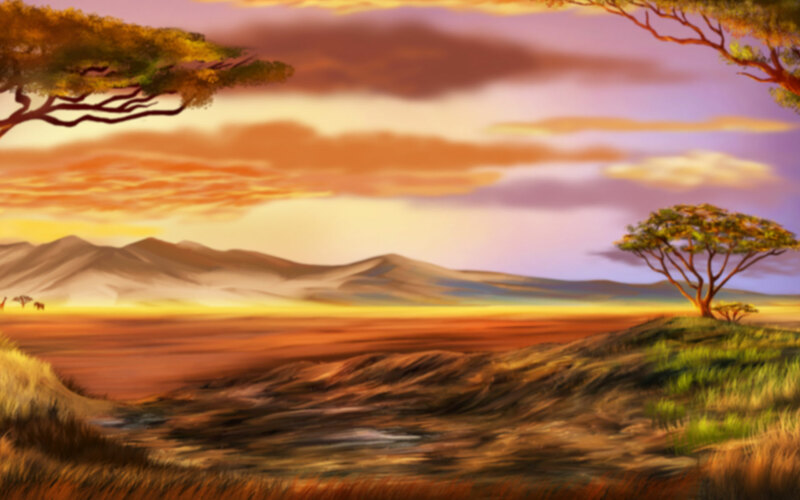 The backdrop is the wild plains of Africa, and I felt like I had been whisked there in an instant. It evoked a feeling of freedom, but was also slightly disconcerting, like trouble was lurking. I fixed on my adult diaper, started to spin and got ready for the inevitable stampede. Stampede has 5 reels and 1024 paylines! So for the steady player that likes churning away wins, this low volatility slot will be highly appealing. The primary symbols are the following animals: elephant, cheetah, eagle, zebra, giraffe, and bushbuck. They are joined by face card letters, a tree symbol which serves as a scatter and a wild symbol (spelled out for you). The wild substitutes for all symbols apart from the scatter. The controls are in a wooden frame which fits in nicely with the theme. The first line displays the Balance and Credits. Underneath are a slew of other options: Mute, Settings, Choose Coin, Bet Level, Win Bet, Max Bet, Spin, Double up (gamble), Autoplay and Info. In the settings, you can find the Turboplay option. These Free Spins can be re-triggered. During your Free Spins, the wild can appear with a x2 or x3 multiplier, but that's not all: the multipliers multiply on themselves. OK – are you scratching your head? I was too, but basically, that means if you got for example a x2, x3 and x3, your win would be multiplied by 18 (2x3x3=18). Got it? There's a Double Up (gamble) option after each winning spin in which you can bet either your entire profit or 50% on a simple coin toss. If you're on a hot streak you can carry on tossing and collecting until you choose to return to the main game. If you lose your profits, you are automatically returned. Cmon people there are 1024 paylines. I think that's pretty unique! Performance While certainly more stunning on the P.C, Stampede charged through my performance tests on all devices. The graphics, music and sound effects are top caliber – I kept the sound for the entire time and found the ambient noises pretty pleasant. I was sold on Stampede when I found out about the 1024 paylines but became a huge fan after playing the game for a while. It's incredible Free Spins and Multipliers will be sure to appeal to most players. The best part of it was no scary stampede animations – a dry adult diaper is a re-usable diaper!